With the soundtrack of Tokyo Drift still playing in my ears since my last post, there is no better time for me to continue on Japan Hour and flood myself with all things Japan like the Great Wave off Kanagawa. Honestly, I've never been on an all-winter holiday till now. I've seen bits of snow here and there but have never walked in flurries, with fluffy flakes constantly falling from the sky and sprinkling on my face. On impulse, we decided to get our butts off this scorching island and make a trip to Japan before the snow melts and makes way for the spring of 2015. 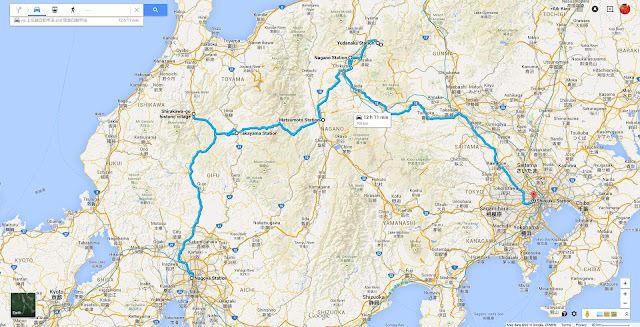 I guess for most people, Hokkaido seems like the choice destination for a winter wonderland holiday. However, images of snow-capped gassho-zukuri minka houses and Japanese macaques bathing in steaming hot spring came to my mind instead. Quite simply and quickly, the itinerary had developed around these two destinations - to visit the vernacular minka houses in the UNESCO World Heritage Site of Shirakawa-go and the snow monkeys in the valley of Jigokudani. And for a change, I shall not bore readers with my usual long-winded stories. This shall be an easy to read, day-by-day pictorial travel journal that brings you through the trip, covering the sights, the transport, the food, and some tips and useful information. Hopefully, it could serve as a guide for planning your next holiday if you are thinking of visiting the minka and the monkey. Nagoya is just a short 6.5hr flight from Singapore. SQ672 seems like a good option. Departing daily at 1.20am, you could get your sleep on-board and arrive by 9am Japan time for breakfast. Getting to the city from Chubu Centrair International Airport was a breeze. The airport Access Plaza is where the train station is located, with a big Meitetsu Line sign clearly visible. The ticket machines are easy to use. Find the 'ENGLISH' button on the touchscreen first and the rest are as simple as 1-2-3. Train fare from the airport to Nagoya station costs 870¥ per person. There are different train services (μ-SKY Limited Express, Express, Semi-Express) running into Nagoya station from the airport. Their main difference is the number of stops they make along the way, hence resulting in their journey time difference which varies from 30 to 50 minutes. Check out Meitetsu's website for their timetable, which is also displayed on the platform (http://www.meitetsu.co.jp/eng/timetable/centrair.asp). Upon arrival at Nagoya station, we decided to grab our breakfast before looking for the connecting train to Takayama. Feeling cold and hungry, we got into the first café we saw - Maccaroni, located on level 1 of the JR Central Towers. It also gave us the opportunity to pull out more clothing from our luggage to keep us warm for the journey ahead. A warm and hearty breakfast to start the day at Maccaroni. And my much-needed morning caffeine topped with a kawaii froth. After breakfast, we found our way to the connected train station and hopped on the JR Limited Express Wide View Hida train to Takayama (高山). Do buy a reserved seat in the Green Car with the 2+1 seat configuration (above photo). And if you wish to enjoy the 2.5 hour journey with a panoramic view of the beautiful countryside, get your seat in Car No.10, which is the leading car. Don't get worried when the train starts moving off from Nagoya in a backward direction. It would change direction after 20 minutes at Gifu and you could look forward to the rest of your journey, literally. The cockpit of the JR Limited Express Wide View Hida train. Watch the spectacular scenery along the Takayama line in the latest curved TV widescreen format. Sit back, relax and enjoy the picturesque countryside along the way. See how the landscape transforms into white gradually through the window, frame by frame on the moving train. Arriving in Takayama station - a humble and rather retro-looking station with very basic provision and exit gates managed by station staff. It's nice to be greeted by the warm and friendly locals in this extremely cold weather. Our accommodation for the next few days in Takayama - Ryokan Asunaro, approximately 7 to 8-minute walk from the train station. Like all ryokans, it is necessary to change into their slippers at the entrance. The slippers are always arranged and placed neatly by their staff. And it is only polite for guests to also leave their slippers behind, neatly arranged before leaving the ryokan. The "hotel lobby" of Ryokan Asunaro, encased in beautiful thick oak structures. The original building and its materials date back to 200 years ago. They were brought to Takayama from Niigata, assembled and reconfigured into the ryokan we see today. Service was excellent and all staff were very friendly and helpful. Highly recommended. There are only 18 guest rooms in Asunaro. We got one with attached private bathroom and irori - a traditional sunken fireplace. There is a small "hot spring" in Ryokan Asunaro. A wonderful facility for guests especially during winter. My mandatory stop every evening for the next few days. Some basic information and instructions for tourists who do not know how to take the Japanese style bath. A chance to get the rules right first before braving the large scale public hot springs in town. A 170 degree view of the "hot spring" pool and bath area (taken with my tiny Sony Action Cam as it'd be ridiculous to bring a DSLR in). The granite pool (right) is quite small but is never crowded. Great to soak in it every evening surrounded by the fragrance of Japanese cypress. Takayama bus station's bus bays with clear signs and route information. There will mostly be someone standing there to assist as well. The Takayama bus station is a key transport hub where all inter-city and sightseeing buses depart from. Despite its importance and high traffic, it's relatively small in size with only 6 bus bays. There is an info and ticket counter inside where its friendly staff would be delighted to assist. Took a bus to Hida no Sato (Hida Folk Village), just 15 minutes ride from the bus station (bus bay number 1). It is an open-air museum where around 30 traditional gassho-zukuri houses built in the Edo period were relocated and rebuilt in this village. The large open space in front is a frozen Goami swan pond. Right after the entrance, visitors were greeted by the familiar faces of huge Totoro created in snow. Every January and February, the Village holds a winter illumination event every evening where all traditional houses get bathed in LED lights, some with slow colour-changing effects. The entire village felt surreal especially with the dense pouring snow when I was there. There were also significantly less tourists after 7pm and the whole place was simply magical. Wrapping up my first day at Hida no Sato with a cup of hot sweet sake, my second serving to be exact. A wonderful gift from the warm and friendly people of Takayama in this freezing sub-zero night. Yes, it was free flow. The weather could feel colder than the numbers suggest due to wind and flurry. It's better to be over-prepared than under-provided. Do bring along REAL winter jackets from reliable makers. Jackets with hoods are absolute essentials. Scarfs, neck and face warmers are very effective as well. Some locals were even wearing ear muffs. Bring a good pair of gloves that are thick enough but also fit well. Better if it's a pair of touchscreen-enabled gloves since we use our smartphones so often. It can be annoying if you are planning to use your smartphone as your camera and need to remove your gloves every now and then. Consider bringing heat packs as well to add some warmth in your pockets. Cold weather is dry weather. Bring some REALLY good moisturiser with you. Those little travel-size tubes will not be enough as it's easy to underestimate the amount of moisturiser needed everyday. Bring different types if you are particular about application on different areas like body and face (remember to check-in if it exceeds 100ml). Get a pair of snow boots or equivalent. Sinking your feet into thick snow (intentionally, inevitably or accidentally) means water seepage into your shoes. Having water in your shoes and wetting your socks in winter do not seem like a good idea. Walking on icy surfaces is extremely slippery too. I've seen many people in their usual sneakers, running or cross-trainer shoes slipped and fell. Otherwise, you may buy an ice-spike sole attachment (around 1,500¥ a pair) to enhance your foot grip. They are available in most souvenir shops. A pair of shades/sunglasses would be useful as the snowy landscape can be rather glaring. Was using Nikon D5100, Nikon AFS DX 10-24mm f3.5-4.5, Sigma 17-70mm f2.8-4 DC, Nikon AFS 50mm f1.4, Nikon AFS VR 70-200mm f2.8, Sony HX50V, Sony Action Cam AS30V, Apple iPhone 6, Samsung Galaxy Edge. Other than keeping your hands warm and functionable, gloves should be of perfect fit to handle and operate your camera easily. Best if they are designed for winter photography. Get touchscreen-enabled gloves if you're using cameras with touchscreen feature. Consider bringing cameras with bigger buttons and controls if you don't mind the bulk. I find it hard to use those tiny buttons on the D5100 with my gloves on. Make sure your equipment can be used in sub-zero environment. Perhaps, do a test in your home fridge before your trip. This includes your lens as many lenses have complex electronic components these days. Use a lens hood. It can be useful to prevent snow from hitting the glass directly, which can be annoying and hard to wipe dry. Extra batteries are critical as they deplete fast in cold weather. A waterproof outermost jacket with a hood could potentially eliminate the need to carry an umbrella during light snow. Imagine carrying an umbrella while trying to shoot. Most indoor areas are well heated during winter, which is great for us but not our lenses. If you have stayed in the warm indoors for long enough (e.g. for a meal), condensation will occur. Hence, try to keep your camera cold in the bag if you want to be able to shoot immediately. There was a choice of Japanese or western breakfast at Ryokan Asunaro. We went with Japanese for the first morning. The shiitake and rice were really, really good. 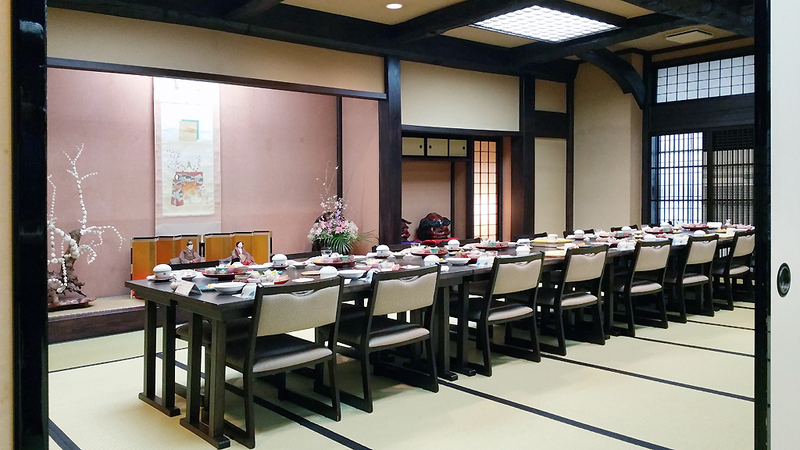 The dining hall in Ryokan Asunaro. A beautiful setting with low furniture and tatami floor. Tables were set up and reserved specifically for each guest room which had requested for breakfast. The long table was set up for a group of tourists in an adjacent dining room. After a warm and hearty breakfast, we took on the streets that were blanketed in snow over a night of flurry. The familiar street outside the ryokan had changed completely overnight. Trees and shrubs were almost completely covered in white along the streets. There were many ice cream shops opened for business and surprisingly, many people were enjoying their ice creams in the snow. A morning stroll to Old Town offers many beautiful views of the Miyagawa river along the way. The Miyagawa Morning Market along, yes, the Miyagawa river. What usually is a bustling morning market would be a deserted street during winter. Takayama Old Town is a charming place. Rows of beautifully conserved traditional houses dating back to the Edo period flank the alleyways, some still kept as homes and some converted to souvenir shops, cafes, and most importantly, sake breweries. Bicycle along the streets of Old Town. A symbol and landmark of Takayama - the Nakabashi red bridge spanning across the Miyagawa river. Take a break and enjoy the beautiful views from the Nakabashi bridge. Other than the Miyagawa Morning Market, the other is located in front of the Takayama Jinya, known as Jinya-mae Market. Fortunately, some stalls were still open for business despite the cold winter. Visiting Takayama Jinya (高山陣屋) - a local government office in the 17th century and continued to be used as an official government building till 1969. It is now conserved and converted into a museum. Takayama Jinya is a substantial complex of several buildings all connected by corridors and courtyards. It comprises rooms of various sizes once used as offices, meeting rooms, guest rooms and residential spaces. Most rooms are immaculately laid with tatami mats and defined with elegant shoji partitions. It is the perfect place to experience, study and learn about traditional Japanese houses. Attached to the main complex is a large storehouse built in the 1600s believed to be the biggest traditional rice storehouse in Japan. No, there is no vintage rice inside but an exhibition of old official documents, old maps and historic town plans. Photography is not allowed inside this storehouse. Look closely and you will find these rabbits on the wooden beams. They are ornamental to hide nails in the joinery. Rabbits were believed to be a charm for fertility and a guardian against fire. Beautiful trimming along the edge of tatami mats. A bird's eye view of Takayama Jinya. No, I didn't bring a drone with me nor did I have a very long selfie stick. This is a photo taken of a photo on display in the visitor centre. Walking back onto the Nakabashi red bridge towards Old Town. The weather was a bit erratic that day. While it had a clear and beautiful sky few minutes ago, there was a sudden heavy snowfall while strolling down Old Town. It was a nice feeling walking through these soft fluffy snow though. Across the town of Takayama, you will not miss signs and banners promoting grilled skewers of the famous Hida-gyu (Hida beef). A must-try for everyone. Some tasty and juicy skewers of Hida-gyu, accompanied by a bottle of hot Takayama sake. A great way to start your lunch. Oily and tasty noodles with dumplings for lunch. The three-storey pagoda of Hida Kokubun-ji temple. The original temple structures were built in the 8th century. The current 22-metre tall pagoda was rebuilt in 1821. The snow-covered temple ground of Hida Kokubun-ji at night when I was out for a walk. The huge tree on the left in the background was a 1,200 years old ginko tree. Walking down the streets of Takayama in the evening, with almost everything seemingly in black and white. The walkways were covered in thick snow, with a temperature of minus 3 degrees Celsius. 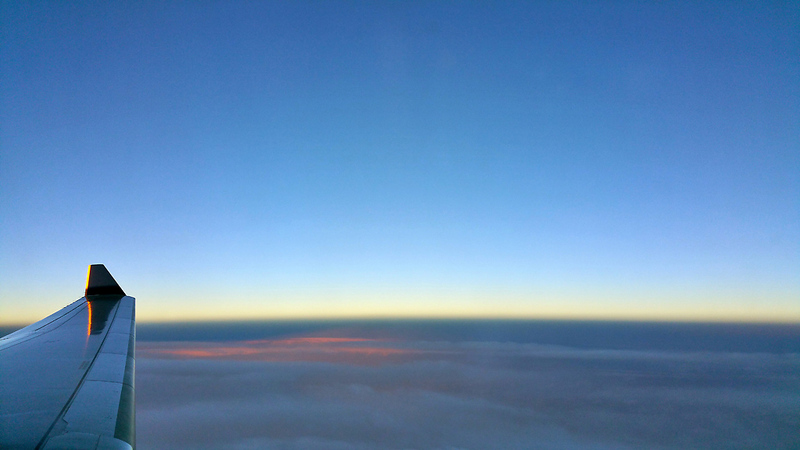 My glove was removed just to be able to swipe the phone to unlock and take this photo. The streets were covered in snow, reflecting the street lights like a self-illuminated road. There was no boundary between the carriageway and the pedestrian walkway. Rest assured that the Japanese are disciplined and responsible drivers. Everyone drives with care and patience there. The Miyagawa river at night with an added drama from the heavy snowfall.